The history of Spain dates back to the Middle Ages. In 1516, Habsburg Spain unified a number of disparate predecessor kingdoms; its modern form of a constitutional monarchy was introduced in 1813, and the current democratic constitution dates to 1978. After the completion of the Reconquista, the Crown of Castile began to explore across the Atlantic Ocean in 1492, expanding into the New World and marking the beginning of the Golden Age under the Spanish Empire. The kingdoms of Spain were united under Habsburg rule in 1516, that unified the Crown of Castile, the Crown of Aragon and smaller kingdoms under the same rule. Until the 1650s, Habsburg Spain was among the most powerful states in the world. During this period, Spain was involved in all major European wars, including the Italian Wars, the Eighty Years' War, the Thirty Years' War, and the Franco-Spanish War. In the later 17th century, however, Spanish power began to decline, and after the death of the last Habsburg ruler, the War of the Spanish Succession ended with the relegation of Spain, now under Bourbon rule, to the status of a second-rate power with a reduced influence in European affairs. The so-called Bourbon Reforms attempted the renewal of state institutions, with some success, but as the century ended, instability set in with the French Revolution and the Peninsular War, so that Spain never regained its former strength. Spain after 1814 was destabilised as different political parties representing "liberal", "reactionary", and "moderate" groups throughout the remainder of the century fought for and won short-lived control without any being sufficiently strong to bring about lasting stability. The former Spanish Empire overseas quickly disintegrated with the Latin American wars of independence. Only Cuba and the Philippines and some small islands were left; they revolted and the United States acquired ownership (or control, in the case of Cuba) after the Spanish–American War of 1898. A tenuous balance between liberal and conservative forces was struck in the establishment of a constitutional monarchy during the Restoration period but brought no lasting solution, and ultimately the last governments of the monarchy changed into a dictatorial rule. Opposing the trend toward authoritarianism of regime changes during the interwar period in Europe, a democratic republic was proclaimed in Spain in 1931. However, six years later the country descended into a Civil War between the Republican and the Nationalist factions. The rebel victory in the conflict installed a dictatorship led by Francisco Franco, that lasted until 1975. The first post-war decade was particularly violent, autocratic, and repressive both in a political, cultural, social, and economical sense. The country experienced rapid economic growth in the 1960s and early 1970s. Only with the death of Franco in 1975 did Spain return to the monarchy, this time headed by Juan Carlos I, and to democracy. With a fresh Constitution voted in 1978, Spain entered the European Economic Community in 1986 (transformed into the European Union with the Maastricht Treaty of 1992), and the Eurozone in 1999. The financial crisis of 2007–08 ended a decade of economic boom and Spain entered a recession and debt crisis and remains plagued by very high unemployment and a weak economy. The Iberian Peninsula was first inhabited by anatomically modern humans about 32,000 years BP. The earliest record of hominids living in Western Europe has been found in the Spanish cave of Atapuerca; a flint tool found there dates from 1.4 million years ago, and early human fossils date to roughly 1.2 million years ago. Modern humans in the form of Cro-Magnons began arriving in the Iberian Peninsula from north of the Pyrenees some 35,000 years ago. The most conspicuous sign of prehistoric human settlements are the famous paintings in the northern Spanish cave of Altamira, which were done c. 15,000 BC and are regarded as paramount instances of cave art. Furthermore, archeological evidence in places like Los Millares and El Argar, both in the province of Almería, and La Almoloya near Murcia suggests developed cultures existed in the eastern part of the Iberian Peninsula during the late Neolithic and the Bronze Age. Spanish prehistory extends to the pre-Roman Iron Age cultures that controlled most of Iberia: those of the Iberians, Celtiberians, Tartessians, Lusitanians, and Vascones and trading settlements of Phoenicians, Carthaginians, and Greeks on the Mediterranean coast. Before the Roman conquest the major cultures along the Mediterranean coast were the Iberians, the Celts in the interior and north-west, the Lusitanians in the west, and the Tartessians in the southwest. The seafaring Phoenicians, Carthaginians, and Greeks successively established trading settlements along the eastern and southern coast. The first Greek colonies, such as Emporion (modern Ampurias), were founded along the northeast coast in the 9th century BC, leaving the south coast to the Phoenicians. The Greeks are responsible for the name Iberia, apparently after the river Iber (Ebro). In the 6th century BC, the Carthaginians arrived in Iberia, struggling first with the Greeks, and shortly after, with the newly arriving Romans for control of the Western Mediterranean. Their most important colony was Carthago Nova (Latin name of modern-day Cartagena). The peoples whom the Romans met at the time of their invasion in what is now known as Spain were the Iberians, inhabiting an area stretching from the northeast part of the Iberian Peninsula through the southeast. The Celts mostly inhabited the inner and north-west part of the peninsula. In the inner part of the peninsula, where both groups were in contact, a mixed culture arose, the Celtiberians. The Celtiberian Wars were fought between the advancing legions of the Roman Republic and the Celtiberian tribes of Hispania Citerior from 181 to 133 BC. The Roman conquest of the peninsula was completed in 19 BC. Hispania was the name used for the Iberian Peninsula under Roman rule from the 2nd century BC. The populations of the peninsula were gradually culturally Romanized, and local leaders were admitted into the Roman aristocratic class. The Romans improved existing cities, such as Tarragona (Tarraco), and established others like Zaragoza (Caesaraugusta), Mérida (Augusta Emerita), Valencia (Valentia), León ("Legio Septima"), Badajoz ("Pax Augusta"), and Palencia. The peninsula's economy expanded under Roman tutelage. Hispania supplied Rome with food, olive oil, wine and metal. The emperors Trajan, Hadrian, and Theodosius I, the philosopher Seneca, and the poets Martial, Quintilian, and Lucan were born in Hispania. Hispanic bishops held the Council of Elvira around 306. After the fall of the Western Roman Empire in the 5th century, parts of Hispania came under the control of the Germanic tribes of Vandals, Suebi, and Visigoths. The collapse of the Western Roman Empire did not lead to the same wholesale destruction of Western classical society as happened in areas like Roman Britain, Gaul and Germania Inferior during the Early Middle Ages, although the institutions and infrastructure did decline. Spain's present languages, its religion, and the basis of its laws originate from this period. The centuries of uninterrupted Roman rule and settlement left a deep and enduring imprint upon the culture of Spain. The first Germanic tribes to invade Hispania arrived in the 5th century, as the Roman Empire decayed. The Visigoths, Suebi, Vandals and Alans arrived in Spain by crossing the Pyrenees mountain range, leading to the establishment of the Suebi Kingdom in Gallaecia, in the northwest, the Vandal Kingdom of Vandalusia (Andalusia), and the Visigothic Kingdom in Toledo. The Romanized Visigoths entered Hispania in 415. After the conversion of their monarchy to Roman Catholicism and after conquering the disordered Suebic territories in the northwest and Byzantine territories in the southeast, the Visigothic Kingdom eventually encompassed a great part of the Iberian Peninsula. As the Roman Empire declined, Germanic tribes invaded the former empire. Some were foederati, tribes enlisted to serve in Roman armies, and given land within the empire as payment, while others, such as the Vandals, took advantage of the empire's weakening defenses to seek plunder within its borders. Those tribes that survived took over existing Roman institutions, and created successor-kingdoms to the Romans in various parts of Europe. Iberia was taken over by the Visigoths after 410. At the same time, there was a process of "Romanization" of the Germanic and Hunnic tribes settled on both sides of the limes (the fortified frontier of the Empire along the Rhine and Danube rivers). The Visigoths, for example, were converted to Arian Christianity around 360, even before they were pushed into imperial territory by the expansion of the Huns. In the winter of 406, taking advantage of the frozen Rhine, refugees from (Germanic) Vandals and Sueves, and the (Sarmatian) Alans, fleeing the advancing Huns, invaded the empire in force. Three years later they crossed the Pyrenees into Iberia and divided the Western parts, roughly corresponding to modern Portugal and western Spain as far as Madrid, between them. The Visigoths, having sacked Rome two years earlier, arrived in the region in 412, founding the Visigothic kingdom of Toulouse (in the south of modern France) and gradually expanded their influence into the Iberian peninsula at the expense of the Vandals and Alans, who moved on into North Africa without leaving much permanent mark on Hispanic culture. The Visigothic Kingdom shifted its capital to Toledo and reached a high point during the reign of Leovigild. The Visigothic Kingdom conquered all of Hispania and ruled it until the early 8th century, when the peninsula fell to the Muslim conquests. The Muslim state in Iberia came to be known as Al-Andalus. After a period of Muslim dominance, the medieval history of Spain is dominated by the long Christian Reconquista or "reconquest" of the Iberian Peninsula from Muslim rule. The Reconquista gathered momentum during the 12th century, leading to the establishment of the Christian kingdoms of Portugal, Aragon, Castile and Navarre and by 1250, had reduced Muslim control to the Emirate of Granada in the south-east of the peninsula. Muslim rule in Granada survived until 1492, when it fell to the Catholic Monarchs. Importantly, Spain never saw a decline in interest in classical culture to the degree observable in Britain, Gaul, Lombardy and Germany. The Visigoths, having assimilated Roman culture during their tenure as foederati, tended to maintain more of the old Roman institutions, and they had a unique respect for legal codes that resulted in continuous frameworks and historical records for most of the period between 415, when Visigothic rule in Spain began, and 711, when it is traditionally said to end. However, during the Visigothic dominion the cultural efforts made by the Franks and other Germanic tribes were not felt in the peninsula, nor achieved in the lesser kingdoms that emerged after the Muslim conquest. The proximity of the Visigothic kingdoms to the Mediterranean and the continuity of western Mediterranean trade, though in reduced quantity, supported Visigothic culture. Arian Visigothic nobility kept apart from the local Catholic population. The Visigothic ruling class looked to Constantinople for style and technology while the rivals of Visigothic power and culture were the Catholic bishops – and a brief incursion of Byzantine power in Córdoba. The Visigoths inherited from Late Antiquity a sort of feudal system in Spain, based in the south on the Roman villa system and in the north drawing on their vassals to supply troops in exchange for protection. The bulk of the Visigothic army was composed of slaves, raised from the countryside. The loose council of nobles that advised Spain's Visigothic kings and legitimized their rule was responsible for raising the army, and only upon its consent was the king able to summon soldiers. The impact of Visigothic rule was not widely felt on society at large, and certainly not compared to the vast bureaucracy of the Roman Empire; they tended to rule as barbarians of a mild sort, uninterested in the events of the nation and economy, working for personal benefit, and little literature remains to us from the period. They did not, until the period of Muslim rule, merge with the Spanish population, preferring to remain separate, and indeed the Visigothic language left only the faintest mark on the modern languages of Iberia. The most visible effect was the depopulation of the cities as they moved to the countryside. Even while the country enjoyed a degree of prosperity when compared to the famines of France and Germany in this period, the Visigoths felt little reason to contribute to the welfare, permanency, and infrastructure of their people and state. This contributed to their downfall, as they could not count on the loyalty of their subjects when the Moors arrived in the 8th century. The Arab Islamic conquest dominated most of North Africa by 710 AD. In 711 an Islamic Berber conquering party, led by Tariq ibn Ziyad, was sent to Iberia to intervene in a civil war in the Visigothic Kingdom. Tariq's army contained about 7,000 Berber horsemen, and Musa bin Nusayr is said to have sent an additional 5,000 reinforcements after the conquest. Crossing the Strait of Gibraltar, they won a decisive victory in the summer of 711 when the Visigothic King Roderic was defeated and killed on July 19 at the Battle of Guadalete. Tariq's commander, Musa, quickly crossed with Arab reinforcements, and by 718 the Muslims were in control of nearly the whole Iberian Peninsula. The advance into Western Europe was only stopped in what is now north-central France by the West Germanic Franks under Charles Martel at the Battle of Tours in 732. A decisive victory for the Christians took place at Covadonga, in the north of the Iberian Peninsula, in the summer of 722. In a minor battle known as the Battle of Covadonga, a Muslim force sent to put down the Christian rebels in the northern mountains was defeated by Pelagius of Asturias, who established the monarchy of the Christian Kingdom of Asturias. In 739, a rebellion in Galicia, assisted by the Asturians, drove out Muslim forces and it joined the Asturian kingdom. The Kingdom of Asturias became the main base for Christian resistance to Islamic rule in the Iberian Peninsula for several centuries. 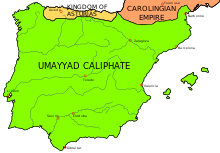 Caliph Al-Walid I had paid great attention to the expansion of an organized military, building the strongest navy in the Umayyad Caliphate era (the second major Arab dynasty after Mohammad and the first Arab dynasty of Al-Andalus). It was this tactic that supported the ultimate expansion to Spain. Caliph Al-Walid I's reign is considered as the apex of Islamic power, though Islamic power in Spain specifically climaxed in the 10th century under Abd-ar-Rahman III. The rulers of Al-Andalus were granted the rank of Emir by the Umayyad Caliph Al-Walid I in Damascus. When the Abbasids overthrew the Umayyad Caliphate, Abd al-Rahman I managed to escape to al-Andalus. Once arrived, he declared al-Andalus independent. It is not clear if Abd al-Rahman considered himself to be a rival caliph, perpetuating the Umayyad Caliphate, or merely an independent Emir. The state founded by him is known as the Emirate of Cordoba. 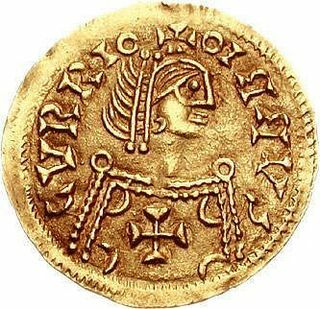 Al-Andalus was rife with internal conflict between the Islamic Umayyad rulers and people and the Christian Visigoth-Roman leaders and people. In the 10th century Abd-ar-Rahman III declared the Caliphate of Córdoba, effectively breaking all ties with the Egyptian and Syrian caliphs. The Caliphate was mostly concerned with maintaining its power base in North Africa, but these possessions eventually dwindled to the Ceuta province. The first navy of the Emir of Córdoba was built after the humiliating Viking ascent of the Guadalquivir in 844 when they sacked Seville. In 942, pagan Magyars raided northern Spain. Meanwhile, a slow but steady migration of Christian subjects to the northern kingdoms in Christian Hispania was slowly increasing the latter's power. Even so, Al-Andalus remained vastly superior to all the northern kingdoms combined in population, economy and military might; and internal conflict between the Christian kingdoms contributed to keep them relatively harmless. Al-Andalus coincided with La Convivencia, an era of relative religious tolerance, and with the Golden age of Jewish culture in the Iberian Peninsula. (See: Emir Abd-ar-Rahman III 912; the Granada massacre 1066). Muslim interest in the peninsula returned in force around the year 1000 when Al-Mansur (also known as Almanzor) sacked Barcelona in 985. Under his son, other Christian cities were subjected to numerous raids. After his son's death, the caliphate plunged into a civil war and splintered into the so-called "Taifa Kingdoms". The Taifa kings competed against each other not only in war but also in the protection of the arts, and culture enjoyed a brief upswing. The Almohads, who had taken control of the Almoravids' Maghribi and al-Andalus territories by 1147, surpassed the Almoravides in fundamentalist Islamic outlook, and they treated the non-believer dhimmis harshly. Faced with the choice of death, conversion, or emigration, many Jews and Christians left. By the mid-13th century, the Emirate of Granada was the only independent Muslim realm in Spain, which survived until 1492 by becoming a vassal state to Castile, to which it paid tribute. Medieval Spain was the scene of almost constant warfare between Muslims and Christians. The Taifa kingdoms lost ground to the Christian realms in the north. After the loss of Toledo in 1085, the Muslim rulers reluctantly invited the Almoravides, who invaded Al-Andalus from North Africa and established an empire. In the 12th century the Almoravid empire broke up again, only to be taken over by the Almohad invasion, who were defeated by an alliance of the Christian kingdoms in the decisive Battle of Las Navas de Tolosa in 1212. By 1250, nearly all of Iberia was back under Christian rule with the exception of the Muslim kingdom of Granada. The Kings of Aragón ruled territories that consisted of not only the present administrative region of Aragon but also Catalonia, and later the Balearic Islands, Valencia, Sicily, Naples and Sardinia (see Crown of Aragon). Considered by most to have been the first mercenary company in Western Europe, the Catalan Company proceeded to occupy the Frankish Duchy of Athens, which they placed under the protection of a prince of the House of Aragon and ruled until 1379. The title page of the Gramática de la lengua castellana (1492), the first grammar of a modern European language to be published. In the 13th century, many languages were spoken in the Christian kingdoms of Iberia. These were the Latin-based Romance languages of Castilian, Aragonese, Catalan, Galician, Aranese, Asturian, Leonese, and Portuguese, and the ancient language isolate of Basque. Throughout the century, Castilian (what is also known today as Spanish) gained a growing prominence in the Kingdom of Castile as the language of culture and communication, at the expense of Leonese and of other close dialects. One example of this is the oldest preserved Castilian epic poem, Cantar de Mio Cid, written about the military leader El Cid. In the last years of the reign of Ferdinand III of Castile, Castilian began to be used for certain types of documents, and it was during the reign of Alfonso X that it became the official language. Henceforth all public documents were written in Castilian; likewise all translations were made into Castilian instead of Latin. At the same time, Catalan and Galician became the standard languages in their respective territories, developing important literary traditions and being the normal languages in which public and private documents were issued: Galician from the 13th to the 16th century in Galicia and nearby regions of Asturias and Leon, and Catalan from the 12th to the 18th century in Catalonia, the Balearic Islands and Valencia, where it was known as Valencian. Both languages were later substituted in its official status by Castilian Spanish, till the 20th century. In the 13th century many universities were founded in León and in Castile. Some, such as the Leonese Salamanca and the Castilian Palencia, were among the earliest universities in Europe. In 1492, under the Catholic Monarchs, the first edition of the Grammar of the Castilian Language by Antonio de Nebrija was published. In the 15th century, the most important among all of the separate Christian kingdoms that made up the old Hispania were the Kingdom of Castile (occupying northern and central portions of the Iberian Peninsula), the Kingdom of Aragon (occupying northeastern portions of the peninsula), and the Kingdom of Portugal occupying the far western Iberian Peninsula. The rulers of the kingdoms of Castile and Aragon were allied with dynastic families in Portugal, France, and other neighboring kingdoms. The death of King Henry IV of Castile in 1474 set off a struggle for power called the War of the Castilian Succession (1475–79). Contenders for the throne of Castile were Henry's one-time heir Joanna la Beltraneja, supported by Portugal and France, and Henry's half-sister Queen Isabella I of Castile, supported by the Kingdom of Aragon and by the Castilian nobility. Isabella retained the throne and ruled jointly with her husband, King Ferdinand II. Isabella and Ferdinand had married in 1469 in Valladolid. Their marriage united both crowns and set the stage for the creation of the Kingdom of Spain, at the dawn of the modern era. That union, however, was a union in title only, as each region retained its own political and judicial structure. Pursuant to an agreement signed by Isabella and Ferdinand on January 15, 1474, Isabella held more authority over the newly unified Spain than her husband, although their rule was shared. Together, Isabella of Castile and Ferdinand of Aragon were known as the "Catholic Monarchs" (Spanish: los Reyes Católicos), a title bestowed on them by Pope Alexander VI. The monarchs oversaw the final stages of the Reconquista of Iberian territory from the Moors with the conquest of Granada, conquered the Canary Islands, and expelled the Jews from Spain under the Alhambra Decree. Although until the 13th century religious minorities (Jews and Muslims) had enjoyed considerable tolerance in Castile and Aragon – the only Christian kingdoms where Jews were not restricted from any professional occupation – the situation of the Jews collapsed over the 14th century, reaching a climax in 1391 with large scale massacres in every major city except Ávila. Over the next century, half of the estimated 80,000 Spanish Jews converted to Christianity (becoming "conversos"). The final step was taken by the Catholic Monarchs, who, in 1492, ordered the remaining Jews to convert or face expulsion from Spain. Depending on different sources, the number of Jews actually expelled, traditionally estimated at 120,000 people, is now believed to have numbered about 40,000. There would be more to follow as Spanish monarchs extended the expulsion decrees to their territories on the Italian peninsula, including Sicily (1493), Naples (1542), and Milan (1597). Over the following decades, Muslims faced the same fate; and about 60 years after the Jews, they were also compelled to convert ("Moriscos") or be expelled. Jews and Muslims were not the only people to be persecuted during this time period. All Roma (Gitano, Gypsy) males between the ages of 18 and 26 were forced to serve in galleys – which was equivalent to a death sentence – but the majority managed to hide and avoid arrest. Isabella ensured long-term political stability in Spain by arranging strategic marriages for each of her five children. Her firstborn, a daughter named Isabella, married Afonso of Portugal, forging important ties between these two neighboring countries and hopefully ensuring future alliance, but Isabella soon died before giving birth to an heir. Juana, Isabella's second daughter, married into the Habsburg dynasty when she wed Philip the Fair, the son of Maximilian I, King of Bohemia (Austria) and likely heir to the crown of the Holy Roman Emperor. This ensured an alliance with the Habsburgs and the Holy Roman Empire, a powerful, far-reaching territory that assured Spain's future political security. Isabella's only son, Juan, married Margaret of Austria, further strengthening ties with the Habsburg dynasty. Isabella's fourth child, Maria, married Manuel I of Portugal, strengthening the link forged by her older sister's marriage. Her fifth child, Catherine, married King Henry VIII of England and was mother to Queen Mary I of England. Taking of Oran by Francisco Jiménez de Cisneros in 1509. The Castilian conquest of the Canary Islands, inhabited by Guanche people, took place between 1402 (with the conquest of Lanzarote) and 1496 (with the conquest of Tenerife). Two periods can be distinguished in this process: the noble conquest, carried out by the nobility in exchange for a pact of vassalage, and the royal conquest, carried out directly by the Crown, during the reign of the Catholic Monarchs. By 1520, European military technology combined with the devastating epidemics such as bubonic plague and pneumonia brought by the Castilians and enslavement and deportation of natives led to the extinction of the Guanches. Isabella and Ferdinand authorized the 1492 expedition of Christopher Columbus, who became the first known European to reach the New World since Leif Ericson. This and subsequent expeditions led to an influx of wealth into Spain, supplementing income from within Castile for the state that would prove to be a dominant power of Europe for the next two centuries. Spain established colonies in North Africa that ranged from the Atlantic Moroccan coast to Tripoli in Libya. Melilla was occupied in 1497, Oran in 1509, Larache in 1610, and Ceuta was annexed from the Portuguese in 1668. Today, both Ceuta and Melilla still remain under Spanish control, together with smaller islets known as the presidios menores (Peñón de Vélez de la Gomera, las Islas de Alhucemas, las Islas de Chafarinas). The Spanish Empire was the first global empire. It was also one of the largest empires in world history. In the 16th century, Spain and Portugal were in the vanguard of European global exploration and colonial expansion. The two kingdoms on the conquest and Iberian Peninsula competed with each other in opening of trade routes across the oceans. Spanish imperial conquest and colonization began with the Canary Islands in 1312 and 1402. which began the Castilian conquest of the Canary Islands, completed in 1495. In the 15th and 16th centuries, trade flourished across the Atlantic between Spain and the Americas and across the Pacific between East Asia and Mexico via the Philippines. Spanish Conquistadors, operating privately, deposed the Aztec, Inca and Maya governments with extensive help from local factions and took control of vast stretches of land. This New World empire was at first a disappointment, as the natives had little to trade. Diseases such as smallpox and measles that arrived with the colonizers devastated the native populations, especially in the densely populated regions of the Aztec, Maya and Inca civilizations, and this reduced the economic potential of conquered areas. Estimates of the pre-Columbian population of the Americas vary but possibly stood at 100 million—one fifth of humanity in 1492. Between 1500 and 1600 the population of the Americas was halved. In Mexico alone, it has been estimated that the pre-conquest population of around 25 million people was reduced within 80 years to about 1.3 million. In the 1520s, large-scale extraction of silver from the rich deposits of Mexico's Guanajuato began to be greatly augmented by the silver mines in Mexico's Zacatecas and Bolivia's Potosí from 1546. These silver shipments re-oriented the Spanish economy, leading to the importation of luxuries and grain. The resource-rich colonies of Spain thus caused large cash inflows for the country. They also became indispensable in financing the military capability of Habsburg Spain in its long series of European and North African wars, though, with the exception of a few years in the 17th century, Taxes in Castile were the most important source of revenue. The Port of Seville in the late 16th century. Seville became one of the most populous and cosmopolitan European cities after the expeditions to the New World. Spain enjoyed a cultural golden age in the 16th and 17th centuries. For a time, the Spanish Empire dominated the oceans with its experienced navy and ruled the European battlefield with its fearsome and well trained infantry, the famous tercios. The financial burden within the peninsula was on the backs of the peasant class while the nobility enjoyed an increasingly lavish lifestyle. From the time beginning with the incorporation of the Portuguese Empire in 1580 (lost in 1640) until the loss of its American colonies in the 19th century, Spain maintained one of the largest empires in the world even though it suffered military and economic misfortunes from the 1640s. Religion played a very strong role in the spread of the Spanish empire. The thought that Spain could bring Christianity to the New World and protect Catholicism in Europe certainly played a strong role in the expansion of Spain's empire. Charles I of Spain (better known in the English-speaking world as the Holy Roman Emperor Charles V) was the most powerful European monarch of his day. Spain's world empire reached its greatest territorial extent in the late 18th century but it was under the Habsburg dynasty in the 16th and 17th centuries it reached the peak of its power and declined. 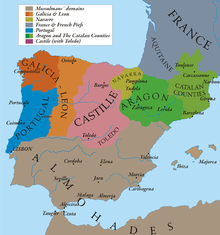 The Iberian Union with Portugal meant that the monarch of Castile was also the monarch of Portugal, but they were ruled as separate entities both on the peninsula and in Spanish America and Brazil. In 1640, the House of Braganza revolted against Spanish rule and reasserted Portugal's independence. When Spain's first Habsburg ruler Charles I became king of Spain in 1516, Spain became central to the dynastic struggles of Europe. 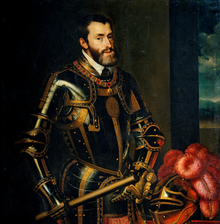 After he became king of Spain, Charles also became Charles V, Holy Roman Emperor and because of his widely scattered domains was not often in Spain. In 1556 Charles abdicated from his positions, giving his Spanish empire to his only surviving son, Philip II of Spain, and the Holy Roman Empire to his brother, Ferdinand. Philip treated Castile as the foundation of his empire, but the population of Castile (about a third of France's) was never large enough to provide the soldiers needed to support the Empire. His marriage to Mary Tudor allied England with Spain. In the 1560s, plans to consolidate control of the Netherlands led to unrest, which gradually led to the Calvinist leadership of the revolt and the Eighty Years' War. The Dutch armies waged a war of maneuver and siege, successfully avoiding set piece battles. This conflict consumed much Spanish expenditure during the later 16th century. Other extremely expensive failures included an attempt to invade Protestant England in 1588 that produced the worst military disaster in Spanish history when the Spanish Armada—costing 10 million ducats—was scattered by a freak storm. Over 8,000 English sailors died from diseases such as dysentery and typhus while the Spanish Armada was at sea. Economic and administrative problems multiplied in Castile, and the weakness of the native economy became evident in the following century. Rising inflation, financially draining wars in Europe, the ongoing aftermath of the expulsion of the Jews and Moors from Spain, and Spain's growing dependency on the silver imports, combined to cause several bankruptcies that caused economic crisis in the country, especially in heavily burdened Castile. The great plague of 1596–1602 killed 600,000 to 700,000 people, or about 10% of the population. Altogether more than 1,250,000 deaths resulted from the extreme incidence of plague in 17th-century Spain. Economically, the plague destroyed the labor force as well as creating a psychological blow to an already problematic Spain. The Spanish Golden Age (in Spanish, Siglo de Oro) was a period of flourishing arts and letters in the Spanish Empire (now Spain and the Spanish-speaking countries of Latin America), coinciding with the political decline and fall of the Habsburgs (Philip III, Philip IV and Charles II). Arts during the Golden Age flourished despite the decline of the empire in the 17th century. The last great writer of the age, Sor Juana Inés de la Cruz, died in New Spain in 1695. The Habsburgs, both in Spain and Austria, were great patrons of art in their countries. El Escorial, the great royal monastery built by King Philip II, invited the attention of some of Europe's greatest architects and painters. Diego Velázquez, regarded as one of the most influential painters of European history and a greatly respected artist in his own time, cultivated a relationship with King Philip IV and his chief minister, the Count-Duke of Olivares, leaving us several portraits that demonstrate his style and skill. El Greco, a respected Greek artist from the period, settled in Spain, and infused Spanish art with the styles of the Italian renaissance and helped create a uniquely Spanish style of painting. Some of Spain's greatest music is regarded as having been written in the period. Such composers as Tomás Luis de Victoria, Luis de Milán and Alonso Lobo helped to shape Renaissance music and the styles of counterpoint and polychoral music, and their influence lasted far into the Baroque period. Spanish literature blossomed as well, most famously demonstrated in the work of Miguel de Cervantes, the author of Don Quixote de la Mancha. Spain's most prolific playwright, Lope de Vega, wrote possibly as many as one thousand plays over his lifetime, over four hundred of which survive to the present day. Spain had experienced severe financial difficulties in the later 16th century, that had caused the Spanish Crown to declare bankruptcy four times in the late 1500s (1557, 1560, 1576, 1596). However, the constant financial strain did not prevent the rise of Spanish power throughout the 16th century. Many different factors—excessive warfare, inefficient taxation, a succession of weak kings in the 17th century, power struggles in the Spanish court—contributed to the decline of the Habsburg Spain in the second half of the 17th century. Philip II died in 1598, and was succeeded by his son Philip III. In his reign (1598–1621) a ten-year truce with the Dutch was overshadowed in 1618 by Spain's involvement in the European-wide Thirty Years' War. Government policy was dominated by favorites, but it was also the period in which the geniuses of Cervantes and El Greco flourished. Philip III was succeeded in 1621 by his son Philip IV of Spain (reigned 1621–65). Much of the policy was conducted by the Count-Duke of Olivares. The Count-Duke of Olivares was the inept prime minister from 1621 to 1643. He over-exerted Spain in foreign affairs and unsuccessfully attempted domestic reform. His policy of committing Spain to recapture Holland led to a renewal of the Eighty Years' War while Spain was also embroiled in the Thirty Years' War (1618–1648). His attempts to centralise power and increase wartime taxation led to revolts in Catalonia and in Portugal, which brought about his downfall. During the Thirty Years' War, in which various Protestant forces battled Imperial armies, France provided subsidies to Habsburg enemies, especially Sweden. Sweden lost and France's First Minister, Cardinal Richelieu, in 1635 declared war on Spain. The open war with Spain started with a promising victory for the French at Les Avins in 1635. The following year Spanish forces based in the Southern Netherlands hit back with devastating lightning campaigns in northern France that left French forces reeling and the economy of the region in tatters. After 1636, however, Olivares, fearful of provoking another disastrous bankruptcy, stopped the advance. In 1640, both Portugal and Catalonia rebelled. Portugal was lost to the crown for good; in northern Italy and most of Catalonia, French forces were expelled and Catalonia's independence was suppressed. In 1643, the French defeated one of Spain's best armies at Rocroi, northern France. 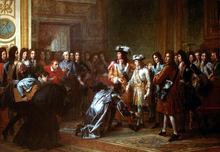 Louis XIV of France and Philip IV of Spain at the Meeting on the Isle of Pheasants in June 1660, part of the process to put an end to the Franco-Spanish War (1635–59). The Spanish "Golden Age" politically ends no later than 1659, with the Treaty of the Pyrenees, ratified between France and Habsburg Spain. During the long regency for Charles II, the last of the Spanish Habsburgs, favouritism milked Spain's treasury, and Spain's government operated principally as a dispenser of patronage. Plague, famine, floods, drought, and renewed war with France wasted the country. The Peace of the Pyrenees (1659) had ended fifty years of warfare with France, whose king, Louis XIV, found the temptation to exploit a weakened Spain too great. Louis instigated the War of Devolution (1667–68) to acquire the Spanish Netherlands. By the 17th century, the Catholic Church and Spain had showcased a close bond to one another, attesting to the fact that Spain was virtually free of Protestantism during the 16th century. In 1620, there were 100,000 Spaniards in the clergy; by 1660 the number had grown to about 200,000, and the Church owned 20% of all the land in Spain. The Spanish bureaucracy in this period was highly centralized, and totally reliant on the king for its efficient functioning. Under Charles II, the councils became the sinecures of wealthy aristocrats despite various attempt at reform. Political commentators in Spain, known as arbitristas, proposed a number of measures to reverse the decline of the Spanish economy, with limited success. In rural areas of Spain, heavy taxation of peasants reduced agricultural output as peasants in the countryside migrated to the cities. The influx of silver from the Americas has been cited as the cause of inflation, although only one fifth of the precious metal, i.e. the quinto real (royal fifth), actually went to Spain. A prominent internal factor was the Spanish economy's dependence on the export of luxurious Merino wool, which had its markets in northern Europe reduced by war and growing competition from cheaper textiles. The once proud Spanish army was falling far behind its foes. It did badly at Bergen op Zoom in 1622, and finance was not to blame. The Dutch won very easily at Hertogenbosch and Wesel in 1629. In 1632 the Dutch captured the strategic fortress town of Maastricht, repulsing three relief armies and dooming the Spanish to defeat. 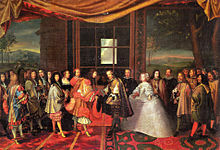 The Hapsburg dynasty became extinct in Spain with Charles II's death in 1700, and the War of the Spanish Succession ensued in which the other European powers tried to assume control of the Spanish monarchy. King Louis XIV of France eventually lost the War of the Spanish Succession The victors were Britain, the Dutch Republic and Austria. They allowed the crown of Spain to pass to the Bourbon dynasty, provided Spain and France would never be merged. Charles II, having no direct heir, was succeeded by his great-nephew Philippe d'Anjou, a French prince, in 1700. Concern among other European powers that Spain and France united under a single Bourbon monarch would upset the balance of power led to the War of the Spanish Succession between 1701 and 1714. It pitted powerful France and fairly strong Spain against the Grand Alliance of England, Portugal, Savoy, the Netherlands and Austria. After many battles, especially in Spain, the treaty of Utrecht recognised Philip, Duke of Anjou, Louis XIV's grandson, as King of Spain (as Philip V), thus confirming the succession stipulated in the will of the Charles II of Spain. However, Philip was compelled to renounce for himself and his descendants any right to the French throne, despite some doubts as to the lawfulness of such an act. Spain's Italian territories were apportioned. Philip V signed the Decreto de Nueva Planta in 1715. This new law revoked most of the historical rights and privileges of the different kingdoms that formed the Spanish Crown, especially the Crown of Aragon, unifying them under the laws of Castile, where the Castilian Cortes Generales had been more receptive to the royal wish. Spain became culturally and politically a follower of absolutist France. Lynch says Philip V advanced the government only marginally over that of his predecessors and was more of a liability than the incapacitated Charles II; when a conflict came up between the interests of Spain and France, he usually favored France. Philip made reforms in government, and strengthened the central authorities relative to the provinces. Merit became more important, although most senior positions still went to the landed aristocracy. Below the elite level, inefficiency and corruption was as widespread as ever. The reforms started by Philip V culminated in much more important reforms of Charles III. The historian Jonathan Israel, however, argues that King Charles III cared little for the Enlightenment and his ministers paid little attention to the Enlightenment ideas influential elsewhere on the Continent. Israel says, "Only a few ministers and officials were seriously committed to enlightened aims. Most were first and foremost absolutists and their objective was always to reinforce monarchy, empire, aristocracy...and ecclesiastical control and authority over education." The economy, on the whole, improved over the depressed 1650–1700 era, with greater productivity and fewer famines and epidemics. Elisabeth of Parma, Philip V's wife, exerted great influence on Spain's foreign policy. Her principal aim was to have Spain's lost territories in Italy restored. In 1717, Philip V ordered an invasion of Sardinia, which had been given to Austria by the Treaty of Utrecht. Spanish troops then invaded Sicily. The aggression prompted the Holy Roman Empire to form a new pact with the members of the Triple Alliance, resulting in the Quadruple Alliance of 1718. All members demanded Spanish retreat from Sardinia and Sicily, resulting in war by December 1718. The war lasted two years and resulted in a rout of the Spanish. Hostilities ceased with the Treaty of The Hague in February 1720. In this settlement, Philip V abandoned all claims on Italy. Later, however, Spain reconquered Naples and Sicily during the War of the Polish Succession (1733–35). In 1748, after the War of the Austrian Succession (1740–48), Spain obtained the duchies of Parma, Piacenza and Guastalla in northern Italy. The rule of the Spanish Bourbons continued under Ferdinand VI (1746–59) and Charles III (1759–88). Under the rule of Charles III and his ministers – Leopoldo de Gregorio, Marquis of Esquilache and José Moñino, Count of Floridablanca – the economy improved. Fearing that Britain's victory over France in the Seven Years' War (1756–63) threatened the European balance of power, Spain allied itself to France and invaded Portugal, a British ally, but suffered a series of military defeats and ended up having to cede Florida to the British at the Treaty of Paris (1763) while gaining Louisiana from France. Spain regained Florida with the Treaty of Paris (1783), which ended the American Revolutionary War (1775–83), and gained an improved international standing. However, there were no reforming impulses in the reign of Charles IV (1788 to abdication in 1808), seen by some as mentally handicapped. Dominated by his wife's lover, Manuel de Godoy, Charles IV embarked on policies that overturned much of Charles III's reforms. After briefly opposing Revolutionary France early in the French Revolutionary Wars, Spain was cajoled into an uneasy alliance with its northern neighbor, only to be blockaded by the British. Charles IV's vacillation, culminating in his failure to honour the alliance by neglecting to enforce the Continental System, led to the invasion of Spain in 1808 under Napoleon I, Emperor of the French, thereby triggering the Peninsular War, with enormous human and property losses, and loss of control over most of the overseas empire. During most of the 18th century Spain had arrested its relative decline of the latter part of the 17th century. But despite the progress, it continued to lag in the political and mercantile developments then transforming other parts of Europe, most notably in Great Britain, the Low Countries, and France. The chaos unleashed by the Peninsular War caused this gap to widen greatly and Spain would not have an Industrial Revolution. El paseo de las Delicias, a 1784-1785 painting by Ramón Bayeu depicting a meeting of members of the aristocracy in the aforementioned location. The Age of Enlightenment reached Spain in attenuated form about 1750. Attention focused on medicine and physics, with some philosophy. French and Italian visitors were influential but there was little challenge to Catholicism or the Church such as characterized the French philosophes. The leading Spanish figure was Benito Feijóo (1676–1764), a Benedictine monk and professor. He was a successful popularizer noted for encouraging scientific and empirical thought in an effort to debunk myths and superstitions. By the 1770s the conservatives had launched a counterattack and used censorship and the Inquisition to suppress Enlightenment ideas. At the top of the social structure of Spain in the 1780s stood the nobility and the church. A few hundred families dominated the aristocracy, with another 500,000 holding noble status. There were 200,000 church men and women, half of them in heavily endowed monasteries that controlled much of the land not owned by the nobles. Most people were on farms, either as landless peons or as holders of small properties. The small urban middle class was growing, but was distrusted by the landowners and peasants alike. The Second of May 1808 was the beginning of the popular Spanish resistance against Napoleon. In the late 18th century, Bourbon-ruled Spain had an alliance with Bourbon-ruled France, and therefore did not have to fear a land war. Its only serious enemy was Britain, which had a powerful navy; Spain therefore concentrated its resources on its navy. When the French Revolution overthrew the Bourbons, a land war with France became a threat which the king tried to avoid. The Spanish army was ill-prepared. The officer corps was selected primarily on the basis of royal patronage, rather than merit. About a third of the junior officers had been promoted from the ranks, and while they did have talent they had few opportunities for promotion or leadership. The rank-and-file were poorly trained peasants. Elite units included foreign regiments of Irishmen, Italians, Swiss, and Walloons, in addition to elite artillery and engineering units. Equipment was old-fashioned and in disrepair. The army lacked its own horses, oxen and mules for transportation, so these auxiliaries were operated by civilians, who might run away if conditions looked bad. In combat, small units fought well, but their old-fashioned tactics were hardly of use against the Napoleonic forces, despite repeated desperate efforts at last-minute reform. When war broke out with France in 1808, the army was deeply unpopular. Leading generals were assassinated, and the army proved incompetent to handle command-and-control. Junior officers from peasant families deserted and went over to the insurgents; many units disintegrated. Spain was unable to mobilize its artillery or cavalry. In the war, there was one victory at the Battle of Bailén, and many humiliating defeats. Conditions steadily worsened, as the insurgents increasingly took control of Spain's battle against Napoleon. Napoleon ridiculed the army as "the worst in Europe"; the British who had to work with it agreed. It was not the Army that defeated Napoleon, but the insurgent peasants whom Napoleon ridiculed as packs of "bandits led by monks" (they in turn believed Napoleon was the devil). By 1812, the army controlled only scattered enclaves, and could only harass the French with occasional raids. The morale of the army had reached a nadir, and reformers stripped the aristocratic officers of most of their legal privileges. Spain initially sided against France in the Napoleonic Wars, but the defeat of her army early in the war led to Charles IV's pragmatic decision to align with the revolutionary French. Spain was put under a British blockade, and her colonies began to trade independently with Britain but it was the defeat of the British invasions of the Río de la Plata in South America (1806 and 1807) that emboldened independence and revolutionary hopes in Spain's North and South American colonies. A major Franco-Spanish fleet was lost at the Battle of Trafalgar in 1805, prompting the vacillating king of Spain to reconsider his difficult alliance with Napoleon. Spain temporarily broke off from the Continental System, and Napoleon – aggravated with the Bourbon kings of Spain – invaded Spain in 1808 and deposed Ferdinand VII, who had been on the throne only forty-eight days after his father's abdication in March 1808. On July 20, 1808, Joseph Bonaparte, eldest brother of Napoleon Bonaparte, entered Madrid and established a government by which he became King of Spain, serving as a surrogate for Napoleon. The former Spanish king was dethroned by Napoleon, who put his own brother on the throne. Spaniards revolted. Thompson says the Spanish revolt was, "a reaction against new institutions and ideas, a movement for loyalty to the old order: to the hereditary crown of the Most Catholic kings, which Napoleon, an excommunicated enemy of the Pope, had put on the head of a Frenchman; to the Catholic Church persecuted by republicans who had desecrated churches, murdered priests, and enforced a "loi des cultes"; and to local and provincial rights and privileges threatened by an efficiently centralized government. Juntas were formed all across Spain that pronounced themselves in favor of Ferdinand VII. On September 26, 1808, a Central Junta was formed in the town of Aranjuez to coordinate the nationwide struggle against the French. Initially, the Central Junta declared support for Ferdinand VII, and convened a "General and Extraordinary Cortes" for all the kingdoms of the Spanish Monarchy. On February 22 and 23, 1809, a popular insurrection against the French occupation broke out all over Spain. The peninsular campaign was a disaster for France. Napoleon did well when he was in direct command, but that followed severe losses, and when he left in 1809 conditions grew worse for France. Vicious reprisals, famously portrayed by Goya in "The Disasters of War", only made the Spanish guerrillas angrier and more active; the war in Spain proved to be a major, long-term drain on French money, manpower and prestige. The promulgation of the Constitution of 1812, oil painting by Salvador Viniegra. In March 1812, the Cádiz Cortes created the first modern Spanish constitution, the Constitution of 1812 (informally named La Pepa). This constitution provided for a separation of the powers of the executive and the legislative branches of government. The Cortes was to be elected by universal suffrage, albeit by an indirect method. Each member of the Cortes was to represent 70,000 people. Members of the Cortes were to meet in annual sessions. The King was prevented from either convening or proroguing the Cortes. Members of the Cortes were to serve single two-year terms. They could not serve consecutive terms; a member could serve a second term only by allowing someone else to serve a single intervening term in office. This attempt at the development of a modern constitutional government lasted from 1808 until 1814. Leaders of the liberals or reformist forces during this revolution were José Moñino, Count of Floridablanca, Gaspar Melchor de Jovellanos and Pedro Rodríguez, Conde de Campomanes. Born in 1728, Floridablanca was eighty years of age at the time of the revolutionary outbreak in 1808. He had served as Prime Minister under King Charles III of Spain from 1777 until 1792; However, he tended to be suspicious of the popular spontaneity and resisted a revolution. Born in 1744, Jovellanos was somewhat younger than Floridablanco. A writer and follower of the philosophers of the Enlightenment tradition of the previous century, Jovellanos had served as Minister of Justice from 1797 to 1798 and now commanded a substantial and influential group within the Central Junta. However, Jovellanos had been imprisoned by Manuel de Godoy, Duke of Alcudia, who had served as the prime minister, virtually running the country as a dictator from 1792 until 1798 and from 1801 until 1808. Accordingly, even Jovellanos tended to be somewhat overly cautious in his approach to the revolutionary upsurge that was sweeping Spain in 1808. The Spanish army was stretched as it fought Napoleon's forces because of a lack of supplies and too many untrained recruits, but at Bailén in June 1808, the Spanish army inflicted the first major defeat suffered by a Napoleonic army; this resulted in the collapse of French power in Spain. Napoleon took personal charge and with fresh forces reconquered Spain in a matter of months, defeating the Spanish and British armies in a brilliant campaign of encirclement. After this the Spanish armies lost every battle they fought against the French imperial forces but were never annihilated; after battles they would retreat into the mountains to regroup and launch new attacks and raids. Guerrilla forces sprang up all over the country and, with the army, tied down huge numbers of Napoleon's troops, making it difficult to sustain concentrated attacks on enemy forces. The attacks and raids of the Spanish army and guerrillas became a massive drain on Napoleon's military and economic resources. In this war, Spain was aided by the British and Portuguese, led by the Duke of Wellington. The Duke of Wellington fought Napoleon's forces in the Peninsular War, with Joseph Bonaparte playing a minor role as king at Madrid. The brutal war was one of the first guerrilla wars in modern Western history. French supply lines stretching across Spain were mauled repeatedly by the Spanish armies and guerrilla forces; thereafter, Napoleon's armies were never able to control much of the country. The war fluctuated, with Wellington spending several years behind his fortresses in Portugal while launching occasional campaigns into Spain. After Napoleon's disastrous 1812 campaign in Russia, Napoleon began to recall his forces for the defence of France against the advancing Russian and other coalition forces, leaving his forces in Spain increasingly undermanned and on the defensive against the advancing Spanish, British and Portuguese armies. At the Battle of Vitoria in 1813, an allied army under the Duke of Wellington decisively defeated the French and in 1814 Ferdinand VII was restored as King of Spain. The pro-independence forces delivered a crushing defeat to the royalists and secured the independence of Peru in the 1824 battle of Ayacucho. Spain lost all of its North and South American colonies, except Cuba and Puerto Rico, in a complex series of revolts 1808–26. Spain was at war with Britain 1798–1808, and the British Navy cut off its ties to its colonies. Trade was handled by American and Dutch traders. The colonies thus had achieved economic independence from Spain, and set up temporary governments or juntas which were generally out of touch with the mother country. After 1814, as Napoleon was defeated and Ferdinand VII was back on the throne, the king sent armies to regain control and reimpose autocratic rule. In the next phase 1809–16, Spain defeated all the uprising. A second round 1816–25 was successful and drove the Spanish out of all of its mainland holdings. Spain had no help from European powers. Indeed, Britain (and the United States) worked against it. When they were cut off from Spain, the colonies saw a struggle for power between Spaniards who were born in Spain (called "peninsulares") and those of Spanish descent born in New Spain (called "creoles"). The creoles were the activists for independence. Multiple revolutions enabled the colonies to break free of the mother country. In 1824 the armies of generals José de San Martín of Argentina and Simón Bolívar of Venezuela defeated the last Spanish forces; the final defeat came at the Battle of Ayacucho in southern Peru. After that Spain played a minor role in international affairs. Business and trade in the ex-colonies were under British control. Spain kept only Cuba and Puerto Rico in the New World. The Napoleonic wars had severe negative effects on Spain's long-term economic development. The Peninsular war ravaged towns and countryside alike, and the demographic impact was the worst of any Spanish war, with a sharp decline in population in many areas caused by casualties, outmigration, and disruption of family life. The marauding armies seized farmers' crops, and more importantly, farmers lost much of their livestock, their main capital asset. Severe poverty became widespread, reducing market demand, while the disruption of local and international trade, and the shortages of critical inputs, seriously hurt industry and services. The loss of a vast colonial empire reduced Spain's overall wealth, and by 1820 it had become one of Europe's poorest and least-developed societies; three-fourths of the people were illiterate. There was little industry beyond the production of textiles in Catalonia. Natural resources, such as coal and iron, were available for exploitation, but the transportation system was rudimentary, with few canals or navigable rivers, and road travel was slow and expensive. British railroad builders were pessimistic about the potential for freight and passenger traffic and did not invest. Eventually a small railway system was built, radiating from Madrid and bypassing the natural resources. The government relied on high tariffs, especially on grain, which further slowed economic development. For example, eastern Spain was unable to import inexpensive Italian wheat, and had to rely on expensive homegrown products carted in over poor roads. The export market collapsed apart from some agricultural products. Catalonia had some industry, but Castile remained the political and cultural center, and was not interested in promoting industry. Although the juntas, that had forced the French to leave Spain, had sworn by the liberal Constitution of 1812, Ferdinand VII had the support of conservatives and he rejected it. He ruled in the authoritarian fashion of his forebears. The government, nearly bankrupt, was unable to pay her soldiers. There were few settlers or soldiers in Florida, so it was sold to the United States for 5 million dollars. In 1820, an expedition intended for the colonies revolted in Cadiz. When armies throughout Spain pronounced themselves in sympathy with the revolters, led by Rafael del Riego, Ferdinand relented and was forced to accept the liberal Constitution of 1812. This was the start of the second bourgeois revolution in Spain, the trienio liberal which would last from 1820 to 1823. Ferdinand himself was placed under effective house arrest for the duration of the liberal experiment. The tumultuous three years of liberal rule that followed (1820–23) were marked by various absolutist conspiracies. The liberal government, which reminded European statesmen entirely too much of the governments of the French Revolution, was viewed with hostility by the Congress of Verona in 1822, and France was authorized to intervene. France crushed the liberal government with massive force in the so-called "Hundred Thousand Sons of Saint Louis" expedition, and Ferdinand was restored as absolute monarch in 1823. In Spain proper, this marked the end of the second Spanish bourgeois revolution. Execution of Torrijos and his men in 1831. Ferdinand VII took repressive measures against the liberal forces in his country. In Spain, the failure of the second bourgeois revolution was followed by a period of uneasy peace for the next decade. Having borne only a female heir presumptive, it appeared that Ferdinand would be succeeded by his brother, Infante Carlos of Spain. While Ferdinand aligned with the conservatives, fearing another national insurrection, he did not view Carlos's reactionary policies as a viable option. Ferdinand – resisting the wishes of his brother – decreed the Pragmatic Sanction of 1830, enabling his daughter Isabella to become Queen. Carlos, who made known his intent to resist the sanction, fled to Portugal. Ferdinand's death in 1833 and the accession of Isabella II as Queen of Spain sparked the First Carlist War (1833–39). Isabella was only three years old at the time so her mother, Maria Cristina of Bourbon-Two Sicilies, was named regent until her daughter came of age. Carlos invaded the Basque country in the north of Spain and attracted support from absolutist reactionaries and conservatives; these forces were known as the "Carlist" forces. The supporters of reform and of limitations on the absolutist rule of the Spanish throne rallied behind Isabella and the regent, Maria Christina; these reformists were called "Cristinos." Though Cristino resistance to the insurrection seemed to have been overcome by the end of 1833, Maria Cristina's forces suddenly drove the Carlist armies from most of the Basque country. Carlos then appointed the Basque general Tomás de Zumalacárregui as his commander-in-chief. Zumalacárregui resuscitated the Carlist cause, and by 1835 had driven the Cristino armies to the Ebro River and transformed the Carlist army from a demoralized band into a professional army of 30,000 of superior quality to the government forces. Zumalacárregui's death in 1835 changed the Carlists' fortunes. The Cristinos found a capable general in Baldomero Espartero. His victory at the Battle of Luchana (1836) turned the tide of the war, and in 1839, the Convention of Vergara put an end to the first Carlist insurrection. The progressive General Espartero, exploiting his popularity as a war hero and his sobriquet "Pacifier of Spain", demanded liberal reforms from Maria Cristina. The Queen Regent, who resisted any such idea, preferred to resign and let Espartero become regent instead in 1840. Espartero's liberal reforms were then opposed by moderates, and the former general's heavy-handedness caused a series of sporadic uprisings throughout the country from various quarters, all of which were bloodily suppressed. He was overthrown as regent in 1843 by Ramón María Narváez, a moderate, who was in turn perceived as too reactionary. Another Carlist uprising, the Matiners' War, was launched in 1846 in Catalonia, but it was poorly organized and suppressed by 1849. 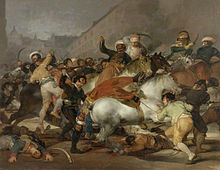 Episode of the 1854 Spanish Revolution in the Puerta del Sol, by Eugenio Lucas Velázquez. Isabella II of Spain took a more active role in government after coming of age, but she was immensely unpopular throughout her reign (1833–68). She was viewed as beholden to whoever was closest to her at court, and the people of Spain believed that she cared little for them. As a result, there was another insurrection in 1854 led by General Domingo Dulce y Garay and General Leopoldo O'Donnell y Jarris. Their coup overthrew the dictatorship of Luis Jose Sartorius, 1st Count of San Luis. As the result of the popular insurrection, the Partido Progresista (Progressive Party) obtained widespread support in Spain and came to power in the government in 1854. In 1856, Isabella attempted to form the Liberal Union, a pan-national coalition under the leadership of Leopoldo O'Donnell, who had already marched on Madrid that year and deposed another Espartero ministry. Isabella's plan failed and cost Isabella more prestige and favor with the people. In 1860, Isabella launched a successful war against Morocco, waged by generals O'Donnell and Juan Prim that stabilized her popularity in Spain. Alongside the French, Spain intervened elsewhere in Cochinchina (1857–63) and Mexico (1861–62). Furthermore, the government accepted Santo Domingo's voluntary return to the Spanish Empire. Spain also extended its military presence in the Pacific off the South American coast. In 1866, a revolt led by Juan Prim was suppressed. Members of the provisional government after the 1868 Glorious Revolution, by Jean Laurent. In 1868 another insurgency, known as the Glorious Revolution took place. The progresista generals Francisco Serrano and Juan Prim revolted against Isabella and defeated her moderado generals at the Battle of Alcolea (1868). Isabella was driven into exile in Paris. Two years later, in 1870, the Cortes declared that Spain would again have a king. Amadeus of Savoy, the second son of King Victor Emmanuel II of Italy, was selected and duly crowned King of Spain early the following year. Amadeus – a liberal who swore by the liberal constitution the Cortes promulgated – was faced immediately with the incredible task of bringing the disparate political ideologies of Spain to one table. The country was plagued by internecine strife, not merely between Spaniards but within Spanish parties. Following the Hidalgo affair and an army rebellion, Amadeus famously declared the people of Spain to be ungovernable, abdicated the throne, and left the country (11 February 1873). In the absence of the Monarch, a government of radicals and Republicans was formed and declared Spain a republic. The First Spanish Republic (1873–74) was immediately under siege from all quarters. The Carlists were the most immediate threat, launching a violent insurrection after their poor showing in the 1872 elections. There were calls for socialist revolution from the International Workingmen's Association, revolts and unrest in the autonomous regions of Navarre and Catalonia, and pressure from the Catholic Church against the fledgling republic. The coup of Pavía took place in January 1874, as the aforementioned General broke into the Cortes. This prevented the formation of a federal republican government, forced the dissolution of the Parliament and led to the instauration of a unitary praetorian republic ruled by General Serrano, paving the way for the Restoration of the Monarchy through another pronunciamiento, this time by Arsenio Martínez Campos, in December 1874. Although the former queen, Isabella II was still alive, she recognized that she was too divisive as a leader, and abdicated in 1870 in favor of her son, Alfonso. 1894 satirical cartoon depicting the tacit accord for seamless government change (turnismo) between the leaders of two dynastic parties (Sagasta and Cánovas del Castillo), with the country being lied in an allegorical fashion. Alfonso XII of Spain was duly crowned on 28 December 1874 after returning from exile. After the tumult of the First Spanish Republic, Spaniards were willing to accept a return to stability under Bourbon rule. The Republican armies in Spain – which were resisting a Carlist insurrection – pronounced their allegiance to Alfonso in the winter of 1874–75, led by Brigadier General Martínez-Campos. The Republic was dissolved and Antonio Cánovas del Castillo, a trusted advisor to the king, was named Prime Minister on New Year's Eve, 1874. The Carlist insurrection was put down vigorously by the new king, who took an active role in the war and rapidly gained the support of most of his countrymen. This new period witnessed the instauration of an uncompetitive parliamentary system in which two "dynastic" parties, the conservatives (formally the Liberal-Conservatives), led by Antonio Cánovas del Castillo (the mastermind behind the Restoration system), and the liberals (or liberal-fusionists), led by Práxedes Mateo Sagasta alternated in control of the government (turnismo). Election fraud (materialized in the so-called caciquismo) became ubiquous, with elections reproducing pre-arranged outcomes struck in the Capital. Voter apathy was no less important. Alfonso XII suddenly died at age 28. Constitutional monarchy continued under King Alfonso XIII. Alfonso XIII was born after his father's death and was proclaimed king upon his birth. Until the coming of age of Alfonso XIII in 1902, his mother Maria Christina of Austria served as Regent. The prime minister Antonio Cánovas del Castillo was assassinated in 1897. In 1868, Cuba launched a war of independence against Spain. On that island, as had been the case in Santo Domingo, the Spanish government found itself embroiled in a difficult campaign against an indigenous rebellion. Unlike in Santo Domingo, however, Spain would initially win this struggle, having learned the lessons of guerrilla warfare well enough to defeat this rebellion. 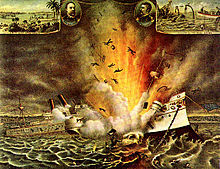 The pacification of the island was temporary, however, as the conflict revived in 1895 and ended in defeat at the hands of the United States in the Spanish–American War of 1898. Cuba gained its independence and Spain lost its remaining New World colony, Puerto Rico, which together with Guam and the Philippines were ceded to the United States for 20 million dollars. 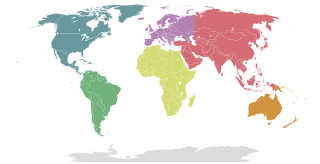 In 1899, Spain sold its remaining Pacific islands – the Northern Mariana Islands, Caroline Islands and Palau – to Germany and Spanish colonial possessions were reduced to Spanish Morocco, Spanish Sahara and Spanish Guinea, all in Africa. The "disaster" of 1898 created the Generation of '98, a group of statesmen and intellectuals who demanded liberal change from the new government. However both Anarchism on the left and fascism on the right grew rapidly in Spain in the early 20th century. A revolt in 1909 in Catalonia was bloodily suppressed. Jensen (1999) argues that the defeat of 1898 led many military officers to abandon the liberalism that had been strong in the officer corps and turn to the right. They interpreted the American victory in 1898 as well as the Japanese victory against Russia in 1905 as proof of the superiority of willpower and moral values over technology. Over the next three decades, Jensen argues, these values shaped the outlook of Francisco Franco and other Falangists. The bipartisan system began to collapse in the later years of the constitutional part of the reign of Alfonso XIII, with the dynastic parties largely disintegrating into factions: the conservatives faced a schism between datistas, mauristas and ciervistas. The liberal camp split into the mainstream liberals followers of the Count of Romanones (romanonistas) and the followers of Manuel García Prieto, the "democrats" (prietistas). An additional liberal albista faction was later added to the last two. Spain's neutrality in World War I allowed it to become a supplier of material for both sides to its great advantage, prompting an economic boom in Spain. The outbreak of Spanish influenza in Spain and elsewhere, along with a major economic slowdown in the postwar period, hit Spain particularly hard, and the country went into debt. A major workers' strike was suppressed in 1919. Spanish colonial policies in Spanish Morocco led to an uprising known as the Rif War; rebels took control of most of the area except for the enclaves of Ceuta and Melilla in 1921. The successful 1925 Alhucemas landing turned the luck in the Rif War towards Spain's favour. King Alfonso XIII tacitly endorsed the September 1923 coup by General Miguel Primo de Rivera that installed a dictatorship. As Prime Minister Primo de Rivera promised to reform the country quickly and restore elections soon. He deeply believed that it was the politicians who had ruined Spain and that governing without them he could regenerate the nation. His slogan was "Country, Religion, Monarchy." Spain (in joint action with France) won a decisive military victory in Morocco, (1925–26). The war had dragged on since 1917 and cost Spain $800 million. The late 1920s were prosperous until the worldwide Great Depression hit in 1929. In early 1930 bankruptcy and massive unpopularity forced the king to remove Primo de Rivera. Historians depict an idealistic but inept dictator who did not understand government, lacked clear ideas and showed very little political acumen. He consulted no one, had a weak staff, and made frequent strange pronouncements. He started with very broad support but lost every element until only the army was left. His projects ran large deficits which he kept hidden. His multiple repeated mistakes discredited the king and ruined the monarchy, while heightening social tensions. Primo de Rivera was replaced by Dámaso Berenguer (his government was known as the dictablanda). The later ruler was in turn replaced by the Admiral Aznar-Cabañas in February 1931. Urban voters had lost faith in the King and voted for republican parties in the municipal elections of April 1931, in what had been considered a referendum on the Monarchy. The king fled the country without abdicating and a republic was established. Celebrations of the proclamation of the 2nd Republic in Barcelona. Political ideologies were intensely polarized, as both right and left saw vast evil conspiracies on the other side that had to be stopped. The central issue was the role of the Catholic Church, which the left saw as the major enemy of modernity and the Spanish people, and the right saw as the invaluable protector of Spanish values. Under the Second Spanish Republic, women were allowed to vote in general elections for the first time. The Republic devolved substantial self-government to Catalonia and, for a brief period in wartime, also to the Basque Provinces. The first cabinets of the Republic were center-left, headed by Niceto Alcalá-Zamora and Manuel Azaña. Economic turmoil, substantial debt, and fractious, rapidly changing governing coalitions led to escalating political violence and attempted coups by right and left. In 1933, the right-wing Spanish Confederation of the Autonomous Right (CEDA), based on the Catholic vote, won power. 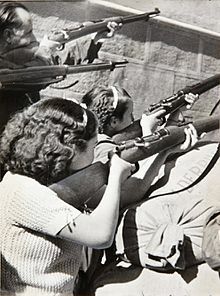 [clarification needed] An armed rising of workers in October 1934, which reached its greatest intensity in Asturias and Catalonia, was forcefully put down by the CEDA[clarification needed] government. This in turn energized political movements across the spectrum in Spain, including a revived anarchist movement and new reactionary and fascist groups, including the Falange and a revived Carlist movement. A devastating 1936–39 civil war was won by the rebel forces supported by Nazi Germany and Fascist Italy, which General Francisco Franco got to lead some months after the beginning of the conflict once other possible challengers to the rebel leadership died. The rebels (backed among other by traditionalist Carlists, Fascist falangists and Far-right alfonsists) defeated the Republican loyalists (with a variable support of Socialists, Liberals, Communists, Anarchists and Catalan and Basque nationalists), who were backed by the Soviet Union. The Spanish Civil War was marked by numerous small battles and sieges, and many atrocities, until the rebels (the "Nationalists"), led by Francisco Franco, won in 1939. There was military intervention as Italy sent land forces, and Germany sent smaller elite air force and armored units to the rebel side (the Nationalists). The Soviet Union sold armaments to the "Loyalists" ("Republicans"), while the Communist parties in numerous countries sent soldiers to the "International Brigades." The civil war did not escalate into a larger conflict, but did become a worldwide ideological battleground that pitted the left and many liberals against Catholics and conservatives. Britain, France and the United States remained neutral and refused to sell military supplies. Worldwide there was a decline in pacifism and a growing sense that another world war was imminent, and that it would be worth fighting for. In the 1930s, Spanish politics were polarized at the left and right extremes of the political spectrum. The left-wing favored class struggle, land reform to overthrow the land owners, autonomy to the regions, and the destruction of the Catholic Church. The right-wing groups, the largest of which was CEDA, a Catholic coalition, believed in tradition, stability and hierarchy. Religion was the main dividing line between right and left, but there were regional variations. The Basques were devoutly Catholic but they put a high priority on regional autonomy. The Left offered a better deal so in 1936–37 they fought for the Republicans. In 1937 they pulled out of the war. The Spanish Republican government moved to Valencia, to escape Madrid, which was under siege by the Nationalists. It had some military strength in the Air Force and Navy, but it had lost nearly all of the regular Army. After opening the arsenals to give rifles, machine guns and artillery to local militias, it had little control over the Loyalist ground forces. Republican diplomacy proved ineffective, with only two useful allies, the Soviet Union and Mexico. Britain, France and 27 other countries had agreed to an arms embargo on Spain, and the United States went along. Nazi Germany and Fascist Italy both signed that agreement, but ignored it and sent supplies and vital help, including a powerful air force under German command, the Condor Legion. Tens of thousands of Italians arrived under Italian command. Portugal supported the Nationalists, and allowed the trans-shipment of supplies to Franco's forces. The Soviets sold tanks and other armaments for Spanish gold, and sent well-trained officers and political commissars. It organized the mobilization of tens of thousands of mostly communist volunteers from around the world, who formed the International Brigades. In 1936, the Left united in the Popular Front and were elected to power. However, this coalition, dominated by the centre-left, was undermined both by the revolutionary groups such as the anarchist Confederación Nacional del Trabajo (CNT) and Federación Anarquista Ibérica (FAI) and by anti-democratic far-right groups such as the Falange and the Carlists. The political violence of previous years began to start again. There were gunfights over strikes; landless labourers began to seize land, church officials were killed and churches burnt. On the other side, right wing militias (such as the Falange) and gunmen hired by employers assassinated left wing activists. The Republican democracy never generated the consensus or mutual trust between the various political groups that it needed to function peacefully. As a result, the country slid into civil war. The right wing of the country and high ranking figures in the army began to plan a coup, and when Falangist politician José Calvo-Sotelo was shot by Republican police, they used it as a signal to act while the Republican leadership was confused and inert. The Nationalists under Franco won the war, and historians continue to debate the reasons. The Nationalists were much better unified and led than the Republicans, who squabbled and fought amongst themselves endlessly and had no clear military strategy. The Army went over to the Nationalists, but it was very poorly equipped – there were no tanks or modern airplanes. The small navy supported the Republicans, but their armies were made up of raw recruits and they lacked both equipment and skilled officers and sergeants. Nationalist senior officers were much better trained and more familiar with modern tactics than the Republicans. On 17 July 1936, General Francisco Franco brought the colonial army stationed in Morocco to the mainland, while another force from the north under General Mola moved south from Navarre. Another conspirator, General Sanjurjo, who was in exile in Portugal, was killed in a plane crash while being brought to join the other military leaders. Military units were also mobilised elsewhere to take over government institutions. Franco intended to seize power immediately, but successful resistance by Republicans in the key centers of Madrid, Barcelona, Valencia, the Basque country, and other points meant that Spain faced a prolonged civil war. By 1937 much of the south and west was under the control of the Nationalists, whose Army of Africa was the most professional force available to either side. Both sides received foreign military aid: the Nationalists from Nazi Germany and Italy, while the Republicans were supported by organised far-left volunteers from the Soviet Union. The Siege of the Alcázar at Toledo early in the war was a turning point, with the Nationalists successfully resisting after a long siege. The Republicans managed to hold out in Madrid, despite a Nationalist assault in November 1936, and frustrated subsequent offensives against the capital at Jarama and Guadalajara in 1937. Soon, though, the Nationalists began to erode their territory, starving Madrid and making inroads into the east. The North, including the Basque country fell in late 1937 and the Aragon front collapsed shortly afterwards. 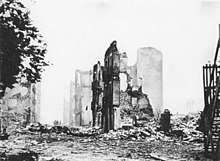 The bombing of Guernica on the afternoon of 26 April 1937 – a mission used as a testing ground for the German Luftwaffe's Condor Legion – was probably the most infamous event of the war and inspired Picasso's painting. The Battle of the Ebro in July–November 1938 was the final desperate attempt by the Republicans to turn the tide. When this failed and Barcelona fell to the Nationalists in early 1939, it was clear the war was over. The remaining Republican fronts collapsed, as civil war broke out inside the Left, as the Republicans suppressed the Communists. Madrid fell in March 1939. The war cost between 300,000 and 1,000,000 lives. It ended with the total collapse of the Republic and the accession of Francisco Franco as dictator of Spain. Franco amalgamated all right wing parties into a reconstituted fascist party Falange and banned the left-wing and Republican parties and trade unions. The Church was more powerful than it had been in centuries. The conduct of the war was brutal on both sides, with widespread massacres of civilians and prisoners. After the war, many thousands of Republicans were imprisoned and up to 150,000 were executed between 1939 and 1943. Some 500,000 refugees escaped to France; they remained in exile for years or decades. The Francoist regime resulted in the deaths and arrests of hundreds of thousands of people who were either supporters of the previous Second Republic of Spain or potential threats to Franco's state. They were executed, sent to prisons or concentration camps. According to Gabriel Jackson, the number of victims of the White Terror (executions and hunger or illness in prisons) just between 1939 and 1943 was 200,000. Child abduction was also a wide-scale practice. The lost children of Francoism may reach 300,000. During Franco's rule, Spain was officially neutral in World War II and remained largely economically and culturally isolated from the outside world. Under a military dictatorship, Spain saw its political parties banned, except for the official party (Falange). Labour unions were banned and all political activity using violence or intimidation to achieve its goals was forbidden. Francisco Franco and his appointed successor Prince Juan Carlos de Borbón. Under Franco, Spain actively sought the return of Gibraltar by the United Kingdom, and gained some support for its cause at the United Nations. During the 1960s, Spain began imposing restrictions on Gibraltar, culminating in the closure of the border in 1969. It was not fully reopened until 1985. Spanish rule in Morocco ended in 1967. Though militarily victorious in the 1957–58 Moroccan invasion of Spanish West Africa, Spain gradually relinquished its remaining African colonies. Spanish Guinea was granted independence as Equatorial Guinea in 1968, while the Moroccan enclave of Ifni had been ceded to Morocco in 1969. Two cities in Africa, Ceuta and Melilla remain under Spanish rule and sovereignty. The latter years of Franco's rule saw some economic and political liberalization (the Spanish miracle), including the birth of a tourism industry. Spain began to catch up economically with its European neighbors. Franco ruled until his death on 20 November 1975, when control was given to King Juan Carlos. In the last few months before Franco's death, the Spanish state went into a paralysis. This was capitalized upon by King Hassan II of Morocco, who ordered the 'Green March' into Western Sahara, Spain's last colonial possession. The Spanish transition to democracy or new Bourbon restoration was the era when Spain moved from the dictatorship of Francisco Franco to a liberal democratic state. The transition is usually said to have begun with Franco's death on 20 November 1975, while its completion is marked by the electoral victory of the socialist PSOE on 28 October 1982. 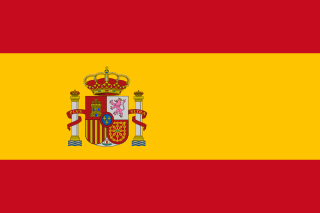 Under its current (1978) constitution, Spain is a constitutional monarchy. It comprises 17 autonomous communities (Andalusia, Aragon, Asturias, Balearic Islands, Canary Islands, Cantabria, Castile and León, Castile–La Mancha, Catalonia, Extremadura, Galicia, La Rioja, Community of Madrid, Region of Murcia, Basque Country, Valencian Community, and Navarre) and 2 autonomous cities (Ceuta and Melilla). Between 1978 and 1982, Spain was led by the Unión del Centro Democrático governments. In 1981 the 23-F coup d'état attempt took place. On 23 February Antonio Tejero, with members of the Guardia Civil entered the Congress of Deputies, and stopped the session, where Leopoldo Calvo Sotelo was about to be named prime minister of the government. Officially, the coup d'état failed thanks to the intervention of King Juan Carlos. Spain joined NATO before Calvo-Sotelo left office. Along with political change came radical change in Spanish society. Spanish society had been extremely conservative under Franco, but the transition to democracy also began a liberalization of values and social mores. 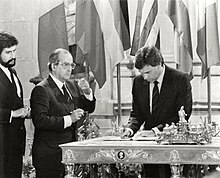 Felipe González signing the treaty of accession to the European Economic Community on 12 June 1985. From 1982 until 1996, the social democratic PSOE governed the country, with Felipe González as prime minister. In 1986, Spain joined the European Economic Community (EEC, now European Union), and the country hosted the 1992 Summer Olympics in Barcelona and Seville Expo '92. In 1996, the centre-right Partido Popular government came to power, led by José María Aznar. On 1 January 1999, Spain exchanged the peseta for the new Euro currency. The peseta continued to be used for cash transactions until January 1, 2002. On 11 March 2004 a number of terrorist bombs exploded on busy commuter trains in Madrid by Islamic extremists linked to Al-Qaeda, killing 191 persons and injuring thousands. The election, held three days after the attacks, was won by the PSOE, and José Luis Rodríguez Zapatero replaced Aznar as prime minister. As José María Aznar and his ministers at first accused ETA of the atrocity, it has been argued that the outcome of the election has been influenced by this event. 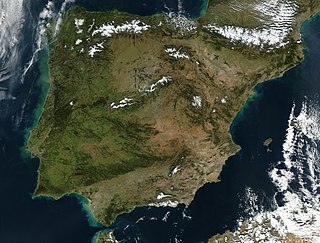 In the wake of its joining the EEC, Spain experienced an economic boom during two decades, cut painfully short by the financial crisis of 2008. During the boom years, Spain attracted a large number of immigrants, especially from the United Kingdom, but also including unknown but substantial illegal immigration, mostly from Latin America, eastern Europe and north Africa. Spain had the fourth largest economy in the Eurozone, but after 2008 the global economic recession hit Spain hard, with the bursting of the housing bubble and unemployment reaching over 25%, sharp budget cutbacks were needed to stay in the Euro zone. The GDP shrank 1.2% in 2012. Although interest rates were historically low, investments were not encouraged sufficiently by entrepreneurs. Losses were especially high in real estate, banking, and construction. Economists concluded in early 2013 that, "Where once Spain's problems were acute, now they are chronic: entrenched unemployment, a large mass of small and medium-sized enterprises with low productivity, and, above all, a constriction in credit." With the financial crisis and high unemployment, Spain is now suffering from a combination of continued illegal immigration paired with a massive emigration of workers, forced to seek employment elsewhere under the EU's "Freedom of Movement", with an estimated 700,000, or 1.5% of total population, leaving the country between 2008 and 2013. Spain is ranked as a middle power able to exert modest regional influence. It has a small voice in international organizations; it is not part of the G8 and participates in the G20 only as a guest. Spain is part of the G6 (EU). ^ "'First west Europe tooth' found". British Broadcasting Corporation. BBC News. 30 June 2007. Archived from the original on March 16, 2018. ^ "Spain – History – Pre-Roman Spain – Prehistory". Britannica Online Encyclopedia. 2008. ^ a b "Spain – History – Pre-Roman Spain – Phoenicians". Britannica Online Encyclopedia. 2008. ^ Grout, James (2007). "The Celtiberian War". Encyclopaedia Romana. University of Chicago. Retrieved 2008-06-08. ^ "Major Phases in Roman History". Rome in the Mediterranean World. University of Toronto. Retrieved 2008-06-08. ^ Great estates, the Latifundia (sing., latifundium), controlled by a land owning aristocracy, were superimposed on the existing Iberian landholding system. ^ a b Rinehart, Robert; Seeley, Jo Ann Browning (1998). "A Country Study: Spain – Hispania". Library of Congress Country Series. Retrieved 2008-08-09. ^ The Roman provinces of Hispania included Provincia Hispania Ulterior Baetica (Hispania Baetica), whose capital was Corduba, presently Córdoba, Provincia Hispania Ulterior Lusitania (Hispania Lusitania), whose capital was Emerita Augusta (now Mérida), Provincia Hispania Citerior, whose capital was Tarraco (Tarragona), Provincia Hispania Nova, whose capital was Tingis (Tánger in present Morocco), Provincia Hispania Nova Citerior and Asturiae-Calleciae (these latter two provinces were created and then dissolved in the 3rd century AD). ^ Payne, Stanley G. (1973). "A History of Spain and Portugal; Ch. 1 Ancient Hispania". The Library of Iberian Resources Online. Retrieved 2008-08-09. ^ Rhea Marsh Smith (1965). Spain: A Modern History. University of Michigan Press. pp. 13–15. ^ Rhea Marsh Smith, Spain: A Modern History, pp. 16–17. ^ Akhbār majmūa, p. 21 of Spanish translation, p. 6 of Arabic text. ^ Fletcher, Richard (2006). Moorish Spain. Los Angeles, California: University of California Press. p. 53. ISBN 0-520-24840-6. ^ a b "Timelines – Vikings, Saracens, Magyars". ^ Brodman, James William. "Ransoming Captives, Chapter One". libro.uca.edu. ^ "Catalan Company (1302–1388 AD)". Archived from the original on 2008-07-04. Retrieved 2008-06-02. ^ Ramón Mariño Paz (1999). Historia da lingua galega. Sotelo Blanco Edicións. pp. 182–194. ISBN 978-84-7824-333-4. Retrieved 19 August 2013. ^ Hugh Thomas, Rivers of Gold (Random House: New York, 2003) p. 18. ^ a b Hugh Thomas, Rivers of Gold, p. 21. ^ Religious Refugees in the Early Modern World: An Alternative History of the Reformation. Cambridge University Press. 2015. p. 108. ISBN 9781107024564. ^ John Mercer (1980). The Canary Islanders: Their Prehistory, Conquest, and Survival. Collings. p. 214. ISBN 978-0-86036-126-8. ^ Hugh Thomas, Rivers of Gold, p. 58. ^ Baten, Jörg (2016). A History of the Global Economy. From 1500 to the Present. Cambridge University Press. p. 159. ISBN 9781107507180. ^ Pérez-Mallaína, Pablo E. (1997). "Auge y decadencia del puerto de Sevilla como cabecera de las rutas indianas" (PDF). Caravelle. Cahiers du monde hispanique et luso-brésilien (69): 23–24. ISSN 2272-9828. ^ Raymond Carr, ed., Spain: A History (2000) pp 116-72. ^ James Patrick (2007). Renaissance and Reformation. Marshall Cavendish. p. 207. ISBN 978-0-7614-7651-1. Retrieved 19 August 2013. ^ Payne, Stanley G. "Chapter 15: A History of Spain and Portugal". libro.uca.edu. ^ For a historiographical debate see Henry Kamen, “The Decline of Spain: A Historical Myth?” Past & Present 81 (Nov. 1978), 24-50 online versus J.I. Israel, "The Decline of Spain: A Historical Myth?" Past & Present No. 91 (1981), pp. 170–180 online. ^ J. H. Elliott (July 1989). The Count-Duke of Olivares: The Statesman in an Age of Decline. Yale University Press. p. 601. ISBN 978-0-300-04499-7. ^ Carl J. Friedrich, The age of the baroque: 1610-1660 (1952) pp. 222-25. ^ R.R. Palmer and Joel Colton, A History of the Modern World to 1815 (5th ed. 1978) p 127. ^ J. H. Elliott (2002). Imperial Spain 1469-1716. Penguin. p. 404. ^ Lesaffer, Randall. "The peace of Utrecht and the balance of power". OUP Blog. Retrieved 5 July 2018. ^ Jonathan Israel (2011). Democratic Enlightenment:Philosophy, Revolution, and Human Rights 1750–1790. Oxford University Press. p. 374. ISBN 9780191620041. ^ Philip Haythornthwaite; Christa Hook (2013). Corunna 1809: Sir John Moore's Fighting Retreat. Osprey. pp. 17–18. ISBN 9781472801982. ^ Russell Crandall (2014). America's Dirty Wars: Irregular Warfare from 1776 to the War on Terror. Cambridge UP. p. 21. ISBN 9781107003132. ^ Julia Ortiz Griffin; William D. Griffin (2007). Spain and Portugal: A Reference Guide from the Renaissance to the Present. Infobase Publishing. p. 241. ISBN 9780816074761. ^ Richard Herr (1971). Modern Spain: An Historical Essay. U. of California Press. pp. 72–3. ISBN 9780520025349. ^ Jesus Cruz (2004). Gentlemen, Bourgeois, and Revolutionaries: Political Change and Cultural Persistence among the Spanish Dominant Groups, 1750–1850. Cambridge U.P. pp. 216–18. ISBN 9780521894166. ^ George F. Nafziger (2002). Historical Dictionary of the Napoleonic Era. Scarecrow Press. p. 158. ISBN 9780810866171. ^ David G. Chandler (1973). The Campaigns of Napoleon. Simon and Schuster. p. 659. ISBN 9781439131039. ^ Todd Fisher (2004). The Napoleonic Wars: The Rise And Fall Of An Empire. Osprey Publishing. p. 222. ISBN 9781841768311. ^ Ian Fletcher (2012). Vittoria 1813: Wellington Sweeps the French from Spain. Osprey Publishing. ISBN 9781782001959. ^ a b John Michael Francis (2006). Iberia and the Americas: Culture, Politics, and History. ABC-CLIO. p. 905. ISBN 9781851094219. ^ John Lynch, ed. Latin American revolutions, 1808–1826: old and new world origins (1994), scholarly essays. ^ Carlos Santiago-Caballero Universidad Carlos III; Leandro Prados de la Escosura Universidad Carlos III and CEPR (April 2018). "The Napoleonic Wars: A Watershed in Spanish History?" (PDF). EHES Working Papers in Economic History No. 1. European Historical Economics Society. p. 1. Retrieved 29 April 2018. ^ David R. Ringrose (1998). Spain, Europe, and the 'Spanish Miracle', 1700–1900. Cambridge U.P. p. 325. ISBN 9780521646307. ^ Carl Cavanagh Hodge (2008). Encyclopedia of the age of imperialism: 1800–1914. A – K. Greenwood. p. 138. Retrieved 13 December 2012. ^ Stanley G. Payne (1967). Politics and the Military in Modern Spain: Stanley G. Payne. Stanford University Press. p. 26. ^ William James Callahan (1984). Church, Politics, and Society in Spain, 1750–1874. Harvard U.P. p. 250. ^ Spencer Tucker (20 May 2009). The Encyclopedia of the Spanish-American and Philippine-American Wars: A Political, Social, and Military History. ABC-CLIO. p. 12. ^ Ortiz, David (2000). "Elections and the Regency Press". Paper Liberals: Press and Politics in Restoration Spain. Westport & London: Greenwood Press. pp. 20–21. ISBN 0-313-312-16-8. ^ Linz, Juan J.; Jerez, Miguel; Corzo, Susana. "Ministers and Regimes in Spain: From First to Second Restoration, 1874-2001" (PDF). Center for European Studies Working Paper (101). ^ Martorell Linares, Miguel Ángel (1997). "La crisis parlamentaria de 1913-1917. La quiebra del sistema de relaciones parlamentarias de la Restauración". Revista de Estudios Políticos. Madrid: Centro de Estudios Constitucionales (96): 146. ^ Martorell Linares 1997, p. 152. ^ Stanley G. Payne (2004). Spanish Civil War, the Soviet Union, and Communism. Yale University Press. p. 106. ^ Michael Alpert, "The Clash of Spanish Armies: Contrasting Ways of War in Spain, 1936–1939," War in History (1999) 6#3 pp 331–351. ^ Adler, Katya (18 October 2011). "Spain's stolen babies and the families who lived a lie". BBC News. ^ Tremlett, Giles (27 January 2011). "Victims of Spanish 'stolen babies network' call for investigation". The Guardian. ^ Baten, Jörg (2016). A History of the Global Economy. From 1500 to the Present. Cambridge University Press. p. 66. ISBN 9781107507180. Altman, Ida. Emigrants and Society, Extremadura and America in the Sixteenth Century. U of California Press 1989. Elliott, J.H., Imperial Spain, 1469–1716. (1963). Elliott, J.H. The Old World and the New. Cambridge 1970. Hamilton, Earl J. American Treasure and the Price Revolution in Spain, 1501–1650. Cambridge MA 1934. Israel, Jonathan I. "Debate—The Decline of Spain: A Historical Myth," Past and Present 91 (May 1981), 170–85. Lynch, John C. Spain under the Habsburgs. (2 vols. 2nd ed. Oxford UP, 1981). Parry, J.H.. The Spanish Seaborne Empire. New York 1966. Payne, Stanley G. Spain: A Unique History (University of Wisconsin Press; 2011) 304 pages; history since the Visigothic era. Phillips, Carla Rahn. "Time and Duration: A Model for the Economy of Early Modern Spain," American Historical Review, Vol. 92. No. 3 (June 1987), pp. 531–562. Pike, Ruth. Enterprise and Adventure: The Genoese in Seville and the Opening of the New World. Ithaca 1966. Pike, Ruth. Aristocrats and Traders: Sevillan Society in the Sixteenth Century. Ithaca 1972. Ringrose, David. Madrid and the Spanish Economy 1560–1850. Berkeley 1983. Thompson, I.A.A. War and Government in Habsburg Spain, 1560-1620. London 1976. Thompson, I.A.A. Crown and Cortes. Government Institutions and Representation in Early-Modern Castile. Brookfield VT 1993. Treasure, Geoffrey. The Making of Modern Europe, 1648–1780 (3rd ed. 2003). pp 332–373. Vivens Vives, Jaime. An Economic History of Spain, 3d edn. rev. Princeton 1969. Walker, Geoffrey. Spanish Politics and Imperial Trade, 1700–1789. Bloomington IN 1979. Cabrera, Miguel A. "Developments in contemporary Spanish historiography: from social history to the new cultural history." Journal of Modern History 77.4 (2005): 988-1023. Feros, Antonio. "Spain and America: All is One”: Historiography of the Conquest and Colonization of the Americas and National Mythology in Spain c. 1892–c. 1992." in Christopher Schmidt-Nowara and John M. Nieto Phillips, eds. Interpreting Spanish Colonialism: Empires, Nations, and Legends (2005). Herzberger, David K. Narrating the past: fiction and historiography in postwar Spain (Duke University Press, 1995). Viñao, Antonio. "From dictatorship to democracy: history of education in Spain." Paedagogica Historica 50#6 (2014): 830–843.. The Iberian Peninsula, also known as Iberia, is located in the southwest corner of Europe. 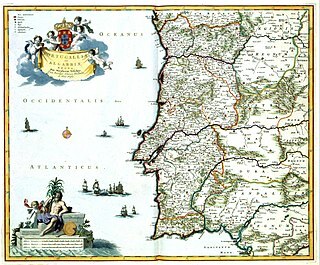 The peninsula is principally divided between Spain and Portugal, comprising most of their territory. It also includes Andorra, small areas of France, and the British overseas territory of Gibraltar. With an area of approximately 596,740 square kilometres (230,400 sq mi)), it is both the second largest European peninsula by area, after the Scandinavian Peninsula, and by population, after the Balkan Peninsula. The Reconquista is a name used in English to describe the period in the history of the Iberian Peninsula of about 780 years between the Umayyad conquest of Hispania in 711 and the fall of the Nasrid kingdom of Granada to the expanding Christian kingdoms in 1492. The completed conquest of Granada was the context of the Spanish voyages of discovery and conquest, and the Americas—the "New World"—ushered in the era of the Spanish and Portuguese colonial empires. The Visigoths were the western branches of the nomadic tribes of Germanic peoples referred to collectively as the Goths. These tribes flourished and spread throughout the late Roman Empire in Late Antiquity, or what is known as the Migration Period. The Visigoths emerged from earlier Gothic groups who had invaded the Roman Empire beginning in 376 and had defeated the Romans at the Battle of Adrianople in 378. Relations between the Romans and the Visigoths were variable, alternately warring with one another and making treaties when convenient. The Visigoths invaded Italy under Alaric I and sacked Rome in 410. After the Visigoths sacked Rome, they began settling down, first in southern Gaul and eventually in Hispania, where they founded the Visigothic Kingdom and maintained a presence from the 5th to the 8th centuries AD. Spaniards, or the Spanish people, are a Romance ethnic group that are indigenous to Spain. They share a common Spanish culture, history, ancestry, and language. Within Spain, there are a number of nationalisms and regionalisms, reflecting the country's complex history and diverse culture. Although the official language of Spain is commonly known as "Spanish", it is only one of the national languages of Spain, and is less ambiguously known as Castilian, a standard language based on the medieval romance speech of the Kingdom of Castile in north and central Spain. Historically, the Spanish people's heritage includes the pre-Celts and Celts. Talavera de la Reina is a city and municipality in the western part of the province of Toledo, which in turn is part of the autonomous community of Castile–La Mancha, Spain. It is the second-largest population center in Castile-La Mancha. Its population of 83,303 makes it the fourth largest town in the region of Castilla-La Mancha, after Albacete, Guadalajara and Toledo. The military history of Portugal is as long as the history of the country, from before the emergence of the independent Portuguese state. In many ways, the history of Spain is marked by waves of conquerors who brought their distinct cultures to the peninsula. After the passage of the Vandals and Alans down the Mediterranean coast of Hispania from 408, the history of medieval Spain begins with the Iberian kingdom of the Arianist Visigoths (507–711), who were converted to Catholicism with their king Reccared in 587. Visigothic culture in Spain can be seen as a phenomenon of Late Antiquity as much as part of the Age of Migrations. The military history of Spain, from the period of the Carthaginian conquests over the Phoenicians to the current Afghan War spans a period of more than 2200 years, and includes the history of battles fought in the territory of modern Spain, as well as her former and current overseas possessions and territories, and the military history of the people of Spain, regardless of geography. France and Spain neighbour each other, with a long border across the Pyrenees. The two countries are member states of the European Union which use the Euro as currency, and are both members of NATO and the Latin Union. The County of Barcelona was originally a frontier region under the rule of the Carolingian dynasty. By the end of the 10th century, the Counts of Barcelona were de facto independent, hereditary rulers in constant warfare with the Islamic Caliphate of Córdoba and its successor states. 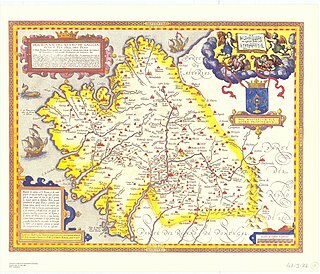 The counts, through marriage alliances and treaties, acquired the other Catalan counties and extended their influence along Occitania. In 1164, the count of Barcelona, Alphons I, inherited the Kingdom of Aragon. Thenceforward, the history of the county of Barcelona is subsumed within that of the Crown of Aragon, but the city of Barcelona remained preeminent within it. Islam was a widespread religion in what is now Spain and Portugal for nine centuries, beginning with the Umayyad conquest of Hispania and ending with its prohibition by the modern Spanish state in the mid-16th century and the expulsion of the Moriscos in the early 17th century. Although a significant proportion of Moriscos returned to Spain or avoided expulsion through various means, and the decree never affected the country's large enslaved Muslim population, the peaceful practice of Islam had faded into obscurity by the 19th century. 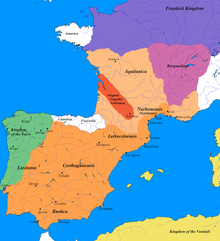 The Visigothic Kingdom or Kingdom of the Visigoths was a kingdom that occupied what is now southwestern France and the Iberian Peninsula from the 5th to the 8th centuries. One of the Germanic successor states to the Western Roman Empire, it was originally created by the settlement of the Visigoths under King Wallia in the province of Gallia Aquitania in southwest Gaul by the Roman government and then extended by conquest over all of Hispania. The Kingdom maintained independence from the Eastern Roman or Byzantine Empire, the attempts of which to re-establish Roman authority in Hispania were only partially successful and short-lived. The Visigoths were romanized central Europeans who had moved west from the Danube Valley. The Visigoths became Foederati of Rome, and wanted to restore the Roman order against the hordes of Vandals, Alans and Suebi. The Western Roman Empire fell in 476 AD; therefore, the Visigoths believed they had the right to take the territories that Rome had promised in Hispania in exchange for restoring the Roman order. Hispania was the Roman name for the Iberian Peninsula and its provinces. Under the Republic, Hispania was divided into two provinces: Hispania Citerior and Hispania Ulterior. During the Principate, Hispania Ulterior was divided into two new provinces, Baetica and Lusitania, while Hispania Citerior was renamed Hispania Tarraconensis. Subsequently, the western part of Tarraconensis was split off, first as Hispania Nova, later renamed "Callaecia". From Diocletian's Tetrarchy onwards, the south of remaining Tarraconensis was again split off as Carthaginensis, and probably then too the Balearic Islands and all the resulting provinces formed one civil diocese under the vicarius for the Hispaniae. 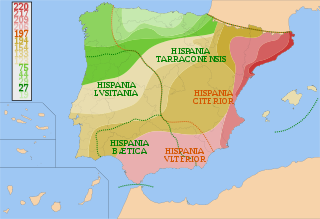 The name, Hispania, was also used in the period of Visigothic rule. Suintila, or Swinthila, Svinthila; was Visigothic King of Hispania, Septimania and Galicia from 621 to 631. There was a new peace in the Kingdom of the Visigoths. As a direct result, by 624 the king was able to retake those lands that had been under the control of the Eastern Roman Empire. He was a son of Reccared I and wife Bado, and a brother of the general Geila.